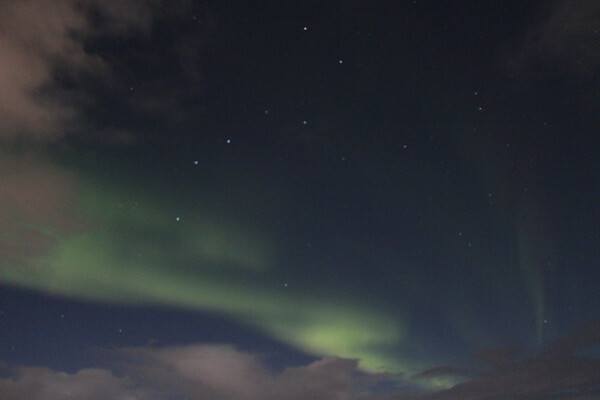 Are you ready to see the dancing Northern Lights in Iceland? The experience feels magical as you witness the universe’s power before your eyes. How do you get to this moment though? 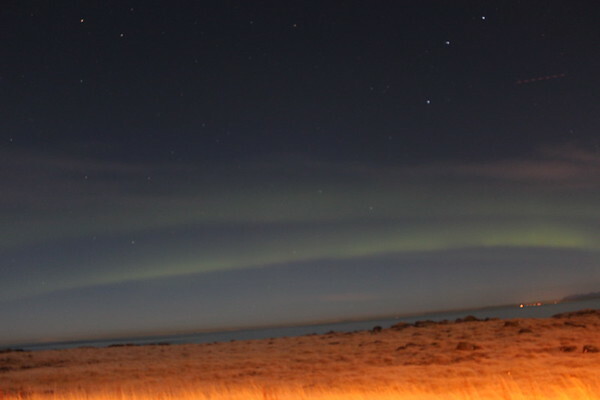 You can hunt for the Northern Lights in Iceland with a tour or DIY. Both are excellent options, but in this post I’ll break them down so you can make the right decision for you. Keep reading until the end for advice on photographing the lights and recommended clothing to stay warm during the hunt. 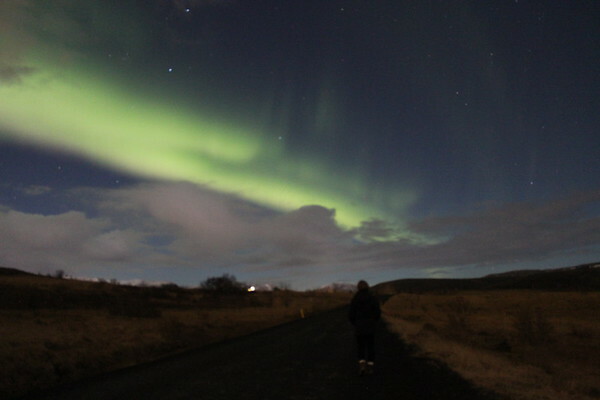 My family and I experienced the Northern Lights via a DIY tour and a tour group while in Iceland last December. The travel agency instructed us to check the hotel lobby’s sign for the status of the Northern Lights tour. It was cancelled the first night due to low solar activity, but was a “go” the second night. Instead of meeting at 8:30pm, the sign said to meet at 9pm. After waiting nearly an hour at the bus stop across the street, we returned to the hotel lobby to see what had happened to our tour. Apparently the sign in the lobby was for a different company, so we were supposed to meet at 8:30pm and missed our tour bus. Oops. The travel agency initially told us to pay for another tour, then submit an inquiry to potentially be refunded. Um, no thank you. We decided to find them ourselves. Do you see the big dipper? It is why we came. And we did see them. The first time I saw the Northern Lights, my eyes widened from amazement and my smile gleamed from the joy of finally seeing the storied lights. The sky shimmered green streaks and slowly danced across the sky. I had the same reaction the second time and will likely have it again the third time. It made me wonder, how is this magic possible? The different gases in Earth’s atmosphere cause the aurora’s colors. Nitrogen and oxygen are the most common gases in the atmosphere, thus blue, red, and green are the most common lights to see. The lights aren’t visible all the time in any country though. Due to the darker season, the lights are visible from November to March. The lights are typically seen in the Northern Lights Zone, which starts at 65 degrees latitude. Iceland is at 66 degrees, making it a good spot to see the lights. Even better sightings are found in destinations further north, for example in Alaska. The Northern Lights are found at the edge of clouds, so you’ll need some cloud cover to see them. Lighting is important for seeing the Northern Lights too. The best lights appear when the moon is small, which you can check here. Don’t fret if there’s a full moon while you’re in Iceland though. My family and I saw the lights twice despite a near full moon! 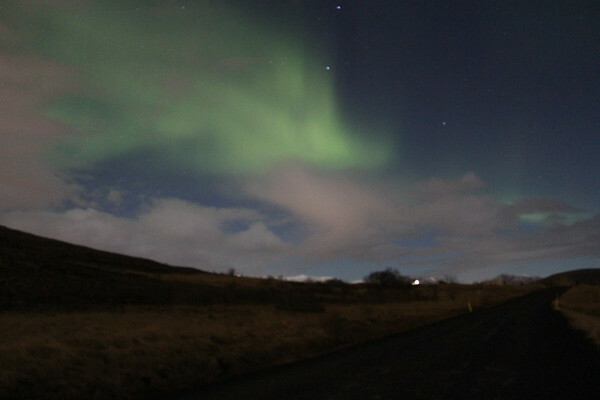 A car is necessary to hunt for the Northern Lights in Iceland. If you’re not planning to rent a car for other Icelandic adventures, it is cheaper and more convenient to book a tour rather than rent a car for one day. If you’re renting a car anyway, I suggest you hunt for the lights yourself. Tip: Our rental car came from SADCars, which we found to generally have the cheapest rentals. Definitely rent a 4×4 during the winter. You’ll have to read the aurora forecast to hunt for the Northern Lights. 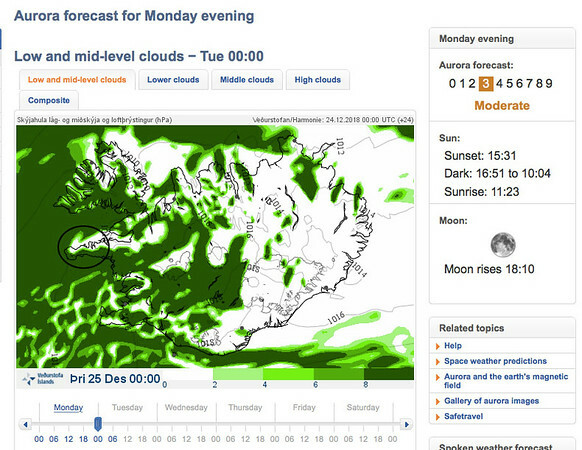 The Icelandic Met Office’s website shows the forecast. You’ll see the outline of Iceland and three colors — white, light green, and dark green. The white means no cloud cover. The dark green means cloud cover. Look for the light green, where the lights are predicted to be. You’ll notice the light green is against the edges of the dark green. If you remember from earlier, this is because the Northern Lights are found at the edge of clouds. 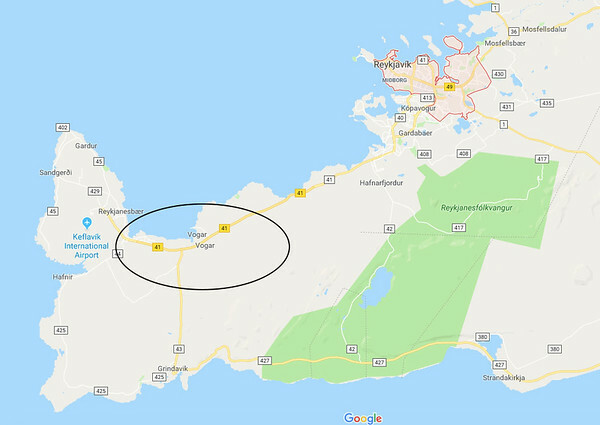 In this example, I would try to see the Lights in the Reykjanes peninsula (the circled area). Now I’m going to zoom in on that area in Google Maps. Now, pull up a Google Map of Iceland beside the aurora forecast. Find the areas in light green on the aurora forecast on Google Maps. Then, find a random store, coordinates, or some address to log into your navigator. Develop some sort of plan and direction of travel within the area of the green shading. I have zoomed in on the Reykjanes Peninsula, where I decided my best/safest chances are to see the lights, as determined by the forecast. Then I familiarized myself with both maps to determine where the light green from the forecast is on Google Maps. I circled this area. In this example, I would drive through the town of Vogue, to Keflavik, then turn around and head halfway down 43 to look for the lights. Drive to the location determined earlier and keep your eyes out for the lights. They are sometimes faint, so it helps to have a driver focusing on the road and a passenger looking at the sky. Once you spot them, continue driving until you find a safe pull-off spot. Remember, it is illegal (and unsafe) to stop on Icelandic roads. The aurora forecast has likelihood predictions from 0-9 in the upper right corner. Anything over 6 should be a great night for lights. When I went, the forecast was a 2 for both nights and I saw lights both nights. The lights were barely visible to the human eye, though, so I doubt you can see the lights at a 0 or 1 rating. We found the lights on a road within Reykjavik city limits, but far outside of the city center. There was a pullover stop perfectly sized for our rental SUV. Only two cars passed while we were there, allowing us to photograph the lights in peace and without headlights or streetlights lights disturbing our eyes or the camera. Plan about an hour to enjoy and photograph the lights. Since you are likely adventuring around the Golden Circle or other parts of Iceland during the day, check the predictions for the area you’ll be in before you leave that area. You might be in a great spot for a light show that evening! Grab a bite to eat and relax in a geothermal pool until it’s time. 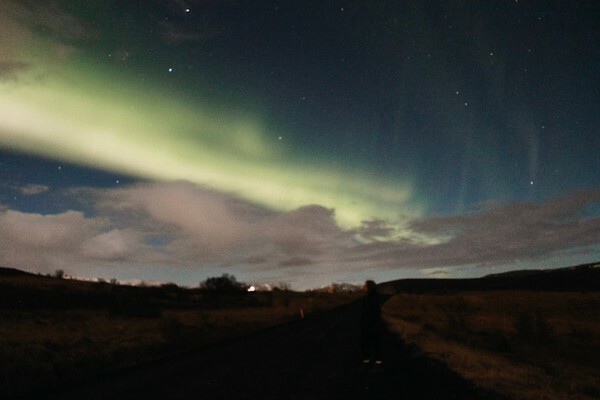 If you’re unsure where to go, bus tours typically go to Thingvellir National Park or the Reykjanes Peninsula to find the lights. Start there. After our last full day of adventuring, we returned to our rooms and found Reykjavik Excursion vouchers on our beds. The travel company rebooked us! Tours are easy. The expert takes you where you need to go. The hardest part of a tour is working your camera (but I have tips on that below for you). The lights on the tour weren’t as good as our DIY tour due to even lower visibility from the near-full moon. In addition, after initially spotting the lights, we traveled for another 15 minutes looking for a good (and legal) stopping point for the large bus and 40-something tourists. By the time we got out, the lights faded. The nearby streetlights put too much light in the foreground, increasing noise in the shot and decreasing the effectiveness of the camera. After an hour to let us photograph and view the lights, the bus moved to another spot with fewer streetlights to hopefully see the lights better. The tour guide told us to wait on the warm bus and she would inform us if the lights came back. They never did, but we waited until midnight before returning to Reykjavik. Book the tour early in your trip in case the tour gets cancelled due to low activity. Booking the tour early in your trip ensures the opportunity to see the lights another night in case there’s rain, a full moon, or even low success on your planned night. Even if the lights appear dim to your eyes, test out your camera. The camera sees more than your eyes. 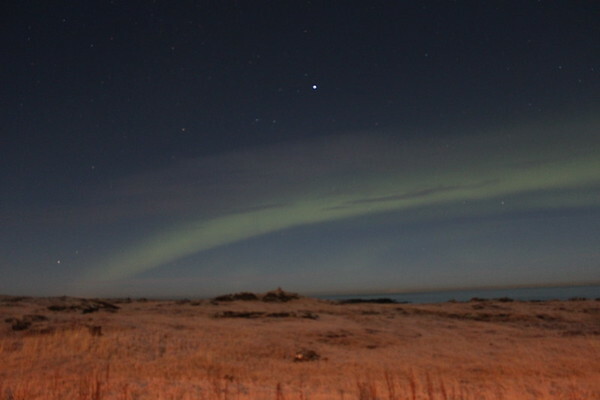 We saw pale green streaks in the sky on our first night, but the camera saw this powerful aurora! Also note that it takes about 5-10 minutes for your eyes to adjust to the night sky. Dim your camera’s menu screen, don’t use your phone, stay away from streetlights, and turn off the vehicle’s lights to help your eyes adjust to the dark and the camera to focus on capturing only the light from the Northern Lights. Blurry photos and a bright foreground may result if you don’t do these things, as seen below. If you are using your phone as a camera, it is worth spending $1 on the app Northern Lights Photo Taker. To avoid a blurry photo, invest in a tripod for your camera. This is because the slow shutter speed required to capture the lights will also show shake from your hands if you hold the camera. A tripod helps you achieve a clearer photo. If you have a point-and-shoot camera, use the nighttime mode. I recommend this one. I recommend purchasing a tripod for this camera too. If you want a spectacular image of the Northern Lights, you need a DSLR. I use a Canon Rebel, which is a great starter camera if you’re still learning how to shoot manual. My photos of the Northern Lights aren’t perfect, but these DSLR guidelines will help you avoid my learning curve. Set up your tripod and put your camera in full manual. I used an older version of this tripod. Use your widest lens to capture the image. You’ll need about an f/2.8 aperture, but no higher than f/5.6. Set your camera to an ISO of 800 or higher. Lower ISO gives you better image quality, so start at 800 and move it up if you can’t get your camera to the right aperture and shutter speed. Set your focus to infinity by putting the lens on manual focus and shifting the most front part of the lens until it’s focused. Set the camera to about a 10-second shutter speed, but no more than 15 seconds. Put the camera’s timer to 2 or more seconds. This prevents shake when you push the shutter. You will likely make several adjustments to get the right photo. I suggest practicing celestial photography before the big moment so you have a better idea of how your camera operates in these settings. It’s cold and windy in Iceland during the winter. Stay warm with thermal leggings, pants, winter socks, a long-sleeve shirt, sweater, long coat, scarf, hat, and gloves. Bring hot chocolate or coffee for the cold and late night. Bring a blanket too! It’s easy to get caught up in the photo, so don’t forget to enjoy the moment. You are about to experience nature’s magic! Do you have any other questions? Have you seen the Northern Lights in Iceland before? I’d love to hear from you.